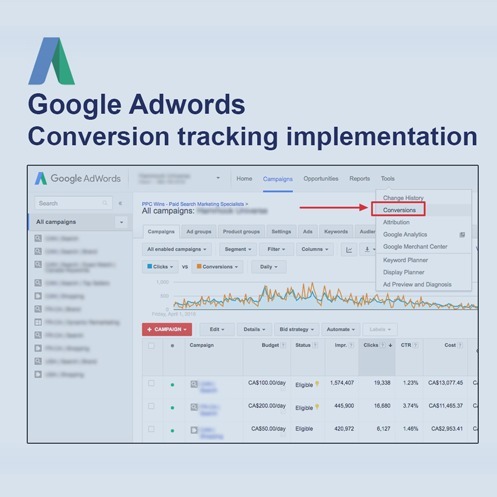 Conversion tracking is a free functionality that shows you what happens after a customer interacts with your Adwords ads -- whether they purchased a product, signed up for your newsletter, called your business, or downloaded your app. When a customer completes an action that you've defined as valuable, these customer actions are called conversions. We will define the customer interactions you regard as valuable, create conversion tags and implement them accordingly. Afterwards, you will be able to evaluate your Adwords campaigns not only based on clicks, and generated traffic, but also in terms of how many soft or hard conversions they generated.